Fish & Loaves on the Fourth of July - June 30, 2013 - The miracle of the fish & loaves as a prelude to Independence. Fr. Vazken ties it all together as Epostle celebrates is 5th Anniversary. Includes a presentation of today's fish & loaves to Suzie Shatarevyan. Sermon delivered by Fr. 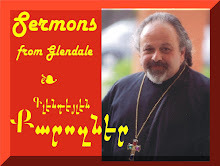 Vazken Movsesian and recorded LIVE at the St. Peter Armenian Church, Glendale. Fr. Vazken's sermon on June 9, 2013 begins with a powerful message: the "Genocide" continues today without weapons, but with drugs, alcohol, materialism and indifference. Our children are dying. Here is a candid expression of fatherly advice to the graduates (and everyone) based on the "Foundation" of Christ. Recorded LIVE at the St. Peter Armenian Church in Glendale. Reader: Taleen Nazarian (Matthew 7:24-7).